Like the Arabian Nights, the Mahabharata and the Odyssey, Tales for THE DREAMER makes use of the enchanting “story within a story” format. But the timeless tales that leaven Wirkala’s gripping adventure novel are drawn from a wide variety of traditions – from Western Europe, to North Africa, to Central Asia – and were chosen not only for their entertainment value, but also for their wisdom, psychological relevance and ability to help readers develop insights into their own behavior and that of others. The action-packed frame story of Tales for THE DREAMER is set in the near future and is sure to grab the attention of young readers. The year is 2036 – a time when technological advances make today’s cars, smartphones and video games seem quaint and old-fashioned. A ship (The Dreamer) carrying environmental scientists and their families embarks from Spain on a journey through North Africa and the Middle East, en route to their new home in Antarctica. But the voyage is threatened by a powerful enemy determined to sabotage the entire mission, the fate of which depends on two resourceful teens: Jamal, a Spaniard with family roots in Syria; and Zeina, a Mauritanian who comes from a long line of storytellers. The adventures of Zeina, Jamal and the rest of The Dreamer’s passengers, as they try to avoid the traps and pitfalls set by their indefatigable nemesis, make for nail-biting, can’t-put-it-down reading – while Zeina’s beguiling tales tie past and present together in a way that gives it all new meaning and unexpected continuity. Delicate line drawings by Argentine artist Mónica Acosta Gutiérrez bring those tales to visual life, and chapter notes at the end of the book provide information on the stories’ origins, as well as other details, for those who might be interested. 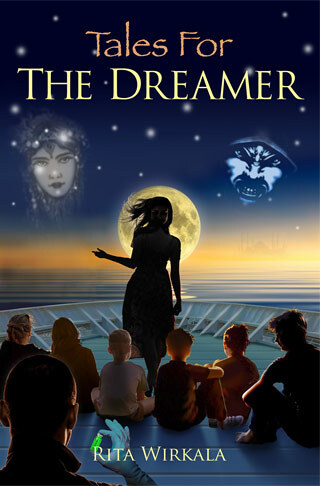 Tales for THE DREAMER takes the reader on a thrilling and enriching ride that pays off on multiple levels. – JonArno Lawson, award-winning author of The Playgrounds of Babel, Inklings, The Hobo’s Crowbar and other titles.